It's hard to believe it's already the last weekend in June. Consolation for the rapid passage of time and therefore the quick succession of fantastic vegetables available? A great round of venues in which to visit, gather, and learn how to cook those vegetables! All organic and fair trade all the time. Best place to ride a train to just to buy eggs. I won't be able to make it this month, but I expect it will be amazing as always! 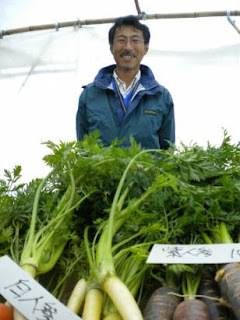 Got a great farmer's market in your area of Tokyo or elsewhere in Japan? I'm always on the lookout and glad to share news of them or photos. Feel free to drop me a note with some basic information, and I'll add it to the list here! Photo: Kobayashi Farm and their groovy purple, white, and orange carrots at the June Earth Day Market in Yoyogi. So good, we even ate the tops!